If, as a wise man once suggested, there's such a fine line between stupid and clever, then the line gets even finer between clever and genuinely funny. Humor is such a delicate thing that it may not take much for a mediocre comedy to suddenly become a very good one, as NBC's "Parks and Recreation" has, or for a great comedy to produce some sub-par episodes, as "30 Rock" has at the start of its fourth season. Neither development is all that surprising. Comedies can take a while to find themselves, as "Parks and Recreation" has, and "30 Rock" sets such a high degree of difficulty for itself that some episodes will inevitably fail to stick the landing. But even though Tina Fey is the Emmy-approved darling of the TV business, at the moment it's her old "SNL" pal Amy Poehler whose show is the best piece of NBC's Thursday sitcom bloc. You can read the full column here. Will have separate, albeit probably brief, posts for both episodes after they air tonight. I basically agree with every word you said about Parks & Recreation. Last season was a bore, but they've already grown and improved so much this season to the point where it's actually outshining The Office, something I never thought possible (though I do think that The Office, fantastic wedding episode aside, is an easier show to beat these days). However, I've never had a problem with 30 Rock. I have seen many complaints similar to yours, and yes, there have been hit-or-miss episodes, but the show almost always works for me. Contrary to how most people feel, for me it's the most consistently hilarious show on television. I like 30 Rock a lot, but don't see it taking over my Friday lunchbreak spot from Parks & Recreation any time soon. And it's a tough spot, mind you, with several other shows I watch (The Office, Bones, The Mentalist, Flash Forward, CSI) waiting in line till I get home. Definitely the best surprise this year, Parks & Rec. After ignoring Parks & Rec after its premiere last year, I've been so pleasantly surprised by the show this season. And as AJ said, I never really have a problem with 30 Rock even on the weaker episodes, because unless they drastically depart from their formula and make the mistake of ignoring the strength of their cast, I can't really see them doing wrong. 30 Rock is so overrated. This last Emmy-winning season only had a handful of good episodes (the Oprah one, the one with Larry King). It was uneven, and the number of guest stars was ridiculous. I wish people would realize how far it's fallen since Season 2. It's no longer a comedy darling. And stop awarding Tina Fey. There are other funny women out there. Also, Parks and Recreation -- brilliant this season. It's kind of interesting that 30 Rock's best season was the second season where it's shortened from the strike (and if you look at it as a season, both S1 and S3 were uneven with some really awesome eps but some really bad ones too) - maybe 30 Rock shouldn't be a 22 ep/season type of show? But I suppose that will never happen, huh? I think Modern Family is the best new comedy of the season, but Parks and Recreation is the most improved, and given that only 6 eps ran for S1, I can honestly say I'm very impressed at how in just one summer they manage to fix everything that was wrong with it and make it into my second favourite 'new-ish' comedy. Given the dismal ratings though, I'm worried. I just hope it can survive as part of the thurs block. They (kind of) did. 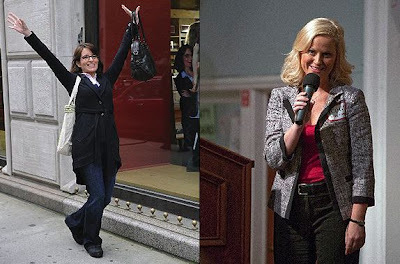 Toni Collette won the best female comedy this year while Tina Fey only got the guest one for being Sarah Palin, which I think she deserved. I asked this on Twitter as @sweaternine, so feel free to answer there as well, but: Is this the best Thursday night NBC line-up since '84-87 (COSBY, FAMILY TIES, CHEERS, NIGHT COURT)? SEINFELD's best mates were probably MAD ABOUT YOU, WINGS & FRASIER or MAD ABOUT YOU, FRIENDS and MADMAN OF THE PEOPLE, and FRIENDS never got a better post-SEINFELD line-up. Anyway, I think it is. I think OFFICE and 30 ROCK and peers to SEINFELD and FRASIER, and COMMUNITY and PARK & REC edge out MAD ABOUT YOU and WINGS in my estimation. The boss's name is wrong...it's Ron F*@%ing Swanson. But I look forward to a night, hopefully very soon, when Poehler and Fey's shows are on fire at the same time. I won't say I ever hated Mad About You, but I can't imagine it ever being brought up as a "best" anything, certainly not in the comedy realm. Alas, it's a family F*@%ing newspaper. I'm glad you're lowering my expectations for the fourth season, but I must admit that I like 30 rock best when it is at its most meta/self-referential. What can I say? I'm a sucker for postmodern TV. Was Wings on Thursday night? I never liked Wings and don't remember it being part of that lineup... there were other shows I didn't like that were part of that lineup... Veronicas Closet... Caroline in the City... ect... but I don't remember Wings as part of it. At least not while Frasier was on. Better Off Ted should also be in the "jokes per minute" discussion. Right now, that show has even more classic quotes than 30 Rock. There are so many, It's hard for me to choose a weekly favorite! I keep hearing about how much Parks and Recreation improved with later episodes, specifically with "Rock Show." I thought the pilot was about as bad as they come, but I like Amy Poehler a lot and I used to love The Office. Would you (Alan or any commenters) suggest I skip straight to the season 1 finale, or should I watch the episodes in its proper order? You can skip straight to the season 1 finale, or even the season 2 premiere. Plot-wise, you're not missing a whole lot. I agree re: 30 Rock. The second season had so many I-can't-believe-this-is-on-TV, laugh-out-loud moments, and season 3 had basically none. I think the best comedy is shocking yet feels so right and earned at the same time. I'm hoping that 30 Rock can return to those types of moments. I enjoyed Parks and Rec season 1, and it took me a bit to adjust to the changes in season 2. I'm totally liking it now though. I hope it isn't canceled.